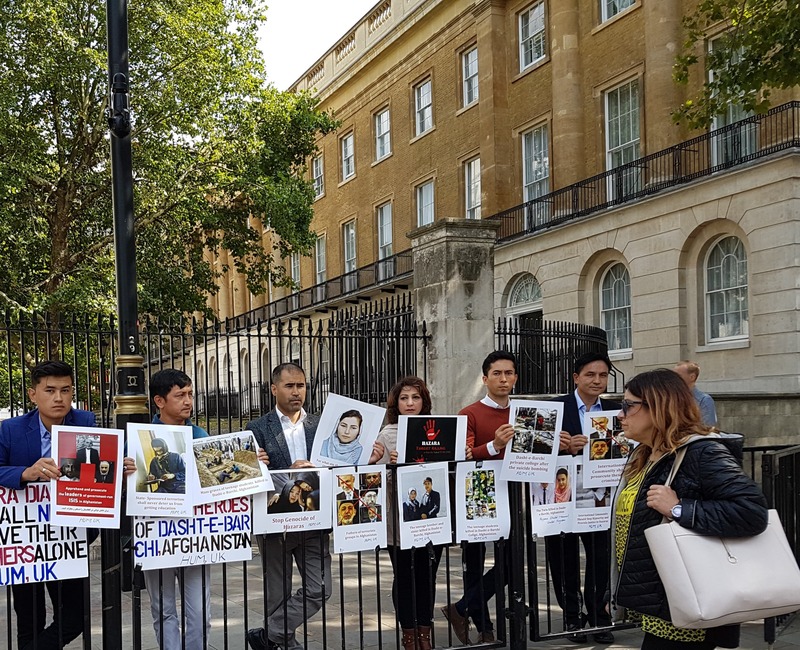 A demonstration was held on 23-08-2018 outside 10 Downing Street, London from 12:30 PM to 4:00 PM against the genocide of beleaguered Hazaras in Afghanistan. The state-sponsored terrorists have targeted Hazaras through suicide bombings, targeted attacks and mass execution, especially attacking public places, schools, places of worship and homes etc to inflict maximum human casualty to all ages. In a recent tragic incident, a private college was targeted by a suicide bomber in west Kabul on 15th August, 2018 when the teenage students were attending mock entry test exam for admissions to universities. The suicide attack killed 48 students instantly but, later, the death toll raised to 101 while leaving scores others critically injured. The demonstration was organised to express solidarity with Hazara and other persecuted minorities of Afghanistan which attracted activists from Southampton, Kent, Burton-on-Trent, Birmingham and London etc. Unlike others, who reneged to their assurances by siting in the comfort of their homes with their wives and children, the protesters held placards and chanted slogans against Ashraf Ghani and the security agencies whose apathy towards their constitutional obligations of protecting the lives of Afghan citizens raised suspicions. The placards read, “Ashraf Ghani Is the Karadzic of Afghanistan”, “International Community Should Stop War Politics in Afghanistan, “Do Not Use Hazaras as Scapegoats in Your Regional Rivalries”, “ICC Should Indict Asharf Ghani for Crimes Against Humanity”, “Afghan Govt. Should Stop Patronising Terrorists”, “For What Sin Was She Killed (81:9-Al Quran)”, “Hazara Diaspora Living in the UK Shall Never Leave Their Brothers Alone”, “Salute to the Fallen Heroes of Dasht-e-Barchi”, “Ashraf Ghani Should Stop Politics of Dead”, “Why the UN Is Silent on the Genocide of Hazaras”, “International Community Should Stop Hypocritical Tactics and Recognise the Genocide of Hazaras” and “Terrorism Shall Never Deter Us from Learning Education”, etc. (i) That the British government should announce an aid package for the victims of Dasht-e-Barchi. (ii) That the British government, through its foreign mission in Afghanistan; should build educational and vocational establishments in far-flung areas of central Afghanistan, especially Hazara-populated areas so that they can learn education without life threats. (iii) The UK government should exercise its powers to help International Criminal Court to institute the trial of Ashraf Ghani for committing Crimes against Humanity. 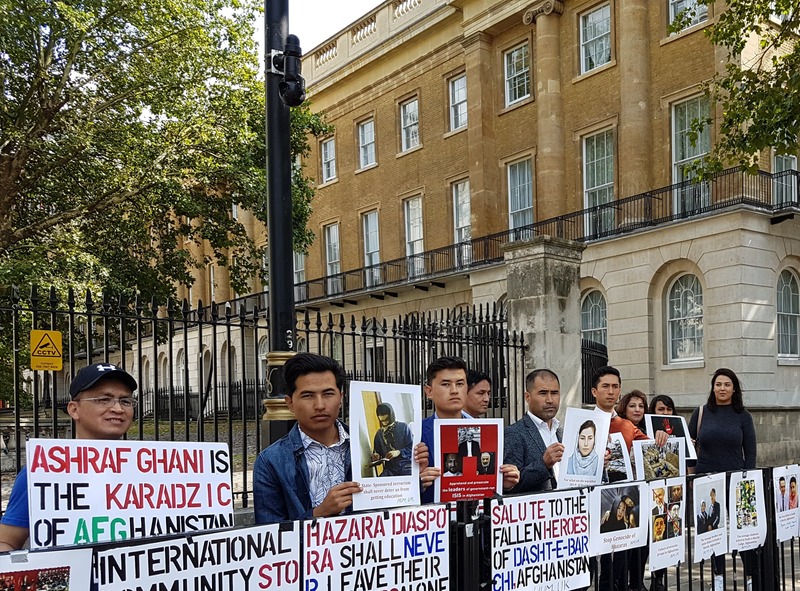 HUM, UK thanked all protesters for defying the odds, especially ethnic Tajik Activists and registering their voice against Genocide of Afghan Hazaras. Posted in Afghanistan, Protests and Demonstrations, United Kingdom (General). Bookmark the permalink. Another incident of targeted-attack on an inbound taxi in the Red Zone area of Quetta city left one Hazara dead and another severely injured. The victims were identified as Nazar Hussain and Gul Hassan. The target-killers, as usual, escaped from the scene after the attack. The terrorist attack took place in bright daylight on 1st April while the safe escape of terrorists exposes the complicity of Pakistan’s federal and provincial governments because Quetta city is protected by dozens of manned check posts and security pickets. Later, the attack was claimed by the so-called terrorist organisation DAESH/ISIS through an electronic statement. The Genocide of Hazaras continues with full complicity of Pakistan since 1999 which has engulfed the lives of over 2000 people and injured more than 4000 others including children and women. 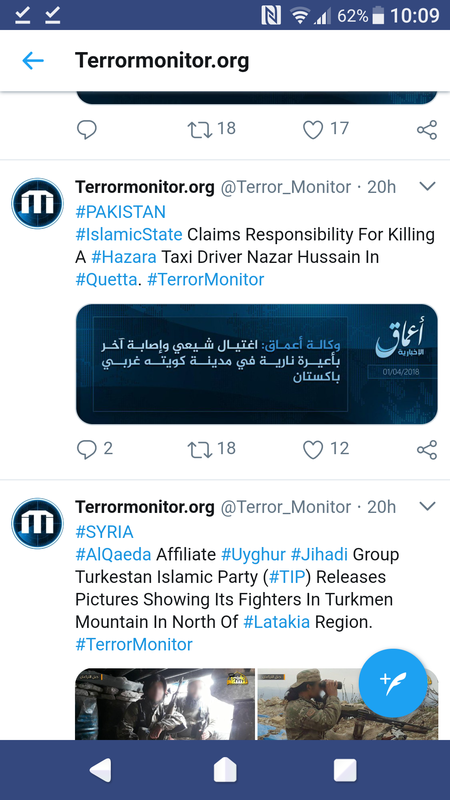 Such terrorist attacks were perpetrated in the forms of mass execution, suicide bombings and targeted-killings etc which have taken place in the heart and south of Quetta city, nonetheless, the government shows no willingness to apprehend the terrorists, financiers, masterminds, sympathisers, co-accomplices, abetters and financiers etc. Dawn News and the Human Rights Commission of Pakistan (Non-Governmental Independent Human Rights Organisation) records that over 1400 terrorist attacks have taken place on on Hazaras since 1999 which is extremely large in number. Despite over 1400 attacks, the Governments have failed to arrest the terrorists. This figure was compiled by the Dawn News and the HRCP in early 2015 but, without any update, the same is being used in preceding records. Latest terrorist attack invited Hazaras to stage sit-in protest on Alamdar Road, Quetta, demanding from International Community and the UN’s Security Council for immediate intervention into the matter as repeated calls from Pakistan’s state organs have completely failed. The Three-Member Supreme Court Bench heard a suo motu notice on Genocide of Hazaras in January this year which had agreed in principal to direct the federal and the provincial governments of forming separate Joint Investigation Teams to probe this issue, however, the final order of the Bench resorted to the verbal promise of the Government for providing foolproof security to Hazaras. The protesters claim to have documentary proofs that the infamous Capital City Police Officer (Razzaque Cheema) is directly involved in killings of, at least, 16 Hazaras. Razzaque Cheema’s service record chronicles that he gave clean chit to the Punjab Govt as he was appointed Head of the five-member Joint Investigation Team (JIT), which was formed in the aftermath of the Model Town Police Shooting on peaceful protesters. Razzaque Cheema’s involvement in killings of innocent citizens cannot be ruled out as he was transferred to Quetta in April, 2013. Last year in November, he was posted and transferred to Punjab and his services were placed at the disposal of Punjab Government through an official notification, having completed his 3 years service in Balochistan as per Government’s civil service rules, however, he still continues to work as CCPO Quetta till filing this report. On 3rd day of the sit-in protest, a number of political parties and civil society organisations attended the protest and expressed their full support to the protesters. The parties and organisations included Balochistan National Party (Mengal), Pashtun Tahaffuz Movement (PTM), Progressive Youth Alliance in Baluchistan and Lawyers’ Forum. The political parties and civil society organisation condemned the government for weeping crocodile’s tears for Indian Kashmir, while Pakistani Hazaras are being target-killed in a small city of Quetta on daily basis, but they fail to pay attention to this grievous situation. (i) President, Balochistan Tajir Forum (BTJ) with his members. (ii) Awami Workers Party (AWP). (iii) Watan Pal Students Organisation. (iv) Adil Jahangir led a delegation of civil society to the protest. (vii) A Delegation of Balochistan Law College. (viii) Intellectual and Writer, Rahat Malik also joined the protest and expressed his support. On the other hand, a group of students took to street in solidarity with the protesters of Quetta. The were, at least, 20 enraged students holding hand-written charts with slogans, “Stop Killing Hazaras, “You Know the Unknown Killers”, “Restore Peace in Balochistan”, “Do Only Kashmiris and Syrians Want Justice, Are We Not Human”, “Who Is Behind This Terrorism”, “Government of Unknown Unacceptable”, “UN Should Take Action”, “UN, Where Are My Rights”, “Why the Most Peaceful Hazaras Are the Most Oppressed in Pakistan”, etc. On another occasion, Democratic Students Alliance, came to streets in Lahore to support Quetta Protest. The angry protesters were seen demanding from the UN in providing foolproof security to Hazaras as the Government has completely failed in its constitutional obligations. 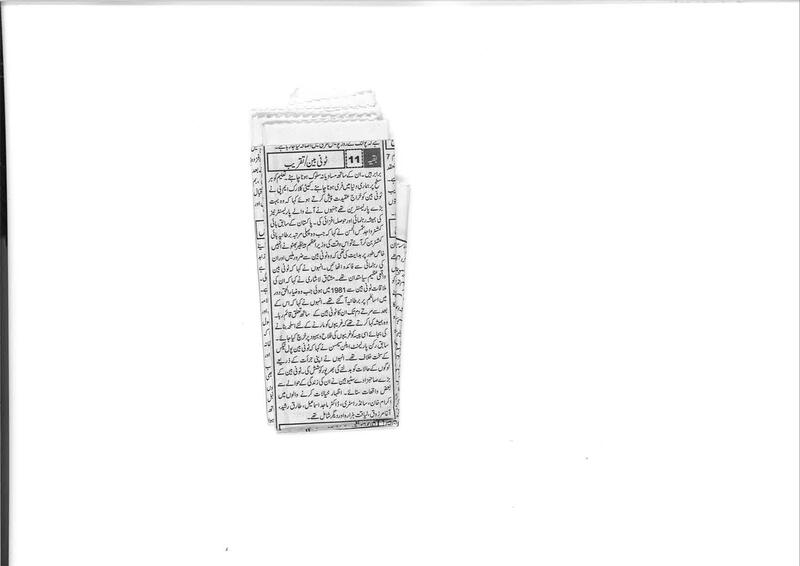 In a heart-wrenching appeal to the Pakistani Army Chief, General Qamar Bajwa, renowned and articulate Tahir Khan Hazara was seen holding the Quran above his head and asked the COAS to provide protection to the beleaguered Hazaras for the sake of Quran as they are being killed every day for the past 20 years. He expressed his disappointment at the apathy and helplessness of the federal and provincial governments towards this urgent issue and reminded the COAS to play his pivotal role in restoring complete peace in Quetta like Parachinar. He said the COAS can restore peace and must do so. He said that we want peace, our children, mothers and daughter want peace and Right to Life. Appealing from COAS for Protection of Hazaras’ for the sake of the Quran. 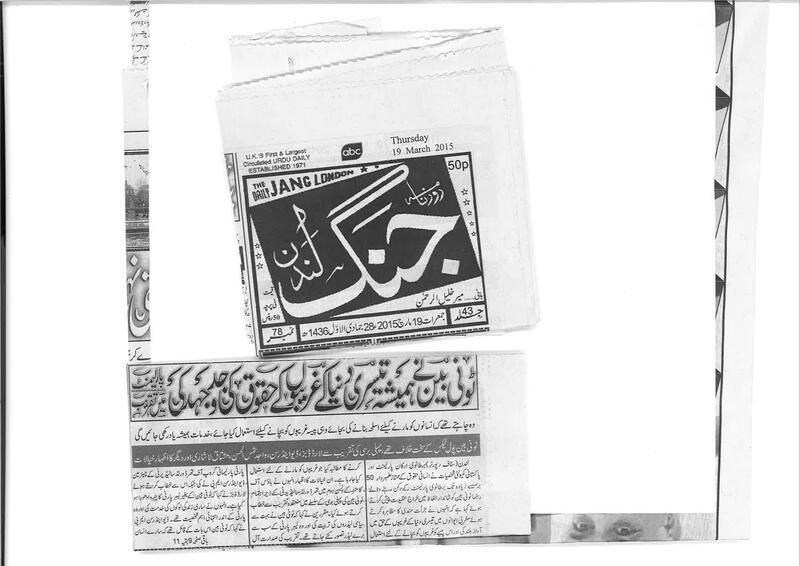 Tahir Khan Hazara Appealing from COAS for Protection of Hazaras’ for the sake of the Quran. On 3rd April, Pakistan’s President Mamnoon Hussain arrived in Quetta on an official visit to attend Bahadur Khan University’s Degree-Awarding Ceremony but he neither visited the sit-in protest nor bothered to enquire about it although the site of the protest is in the same proximity. Mamnoon Hussain should have been compassionate as Hazara taxi driver killed on 1st April was from the down-trodden class of society and, working on daily wages as labourer, he possessed striking similarities with the former for he was fruit chat seller before becoming the President. (i) That an emergency meeting of the United Nation’s Security Council (UNSC) be convened to discuss the Genocide of Hazaras. (ii) That the UNSC should form an International Commission of Enquiry to investigate Genocide of Hazaras. (iii) That the UNSC, under its Chapter VII; should deploy international peace-keeping forces to restive Balochistan, specially Quetta city to protect Hazaras and other minorities. (iv) That the UNSC should declare the ongoing killings of Hazaras as Genocide under the Article 2 of the UN Convention on the Prevention and Punishment of the Crime of Genocide. This is a developing story which will be updated as more news become available. Posted in Pakistan, Protests and Demonstrations and tagged Alamdar Road, Alamdar Road Protest, Alamdar Road Sit-in, Quetta Protest, Tahir Khan Hazara. Bookmark the permalink. 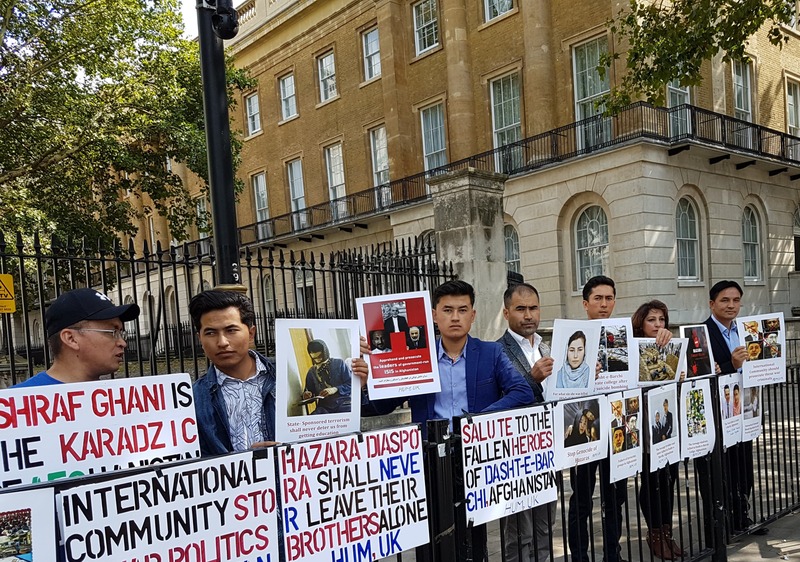 After a consultative meeting of Hazara Diaspora in UK, it has been unanimously agreed to call off the protest in front of 10 Downing Street, London. The protest outside 10 Downing Street to be held on 12-11-2015 was announced two days ago after a joint meeting of Hazara International Forum of Great Britain, Hazara United Movement (HUM), United Kingdom and other campaigners had finalized the event. The decision to hold the protest in front of 10 Downing Street came with honest and sincere view that such step shall bring huge human rights violations of Hazaras of Afghanistan into international limelight and urge the international community for playing their pivotal role in providing security and protection to Hazaras and other minorities in Afghanistan. 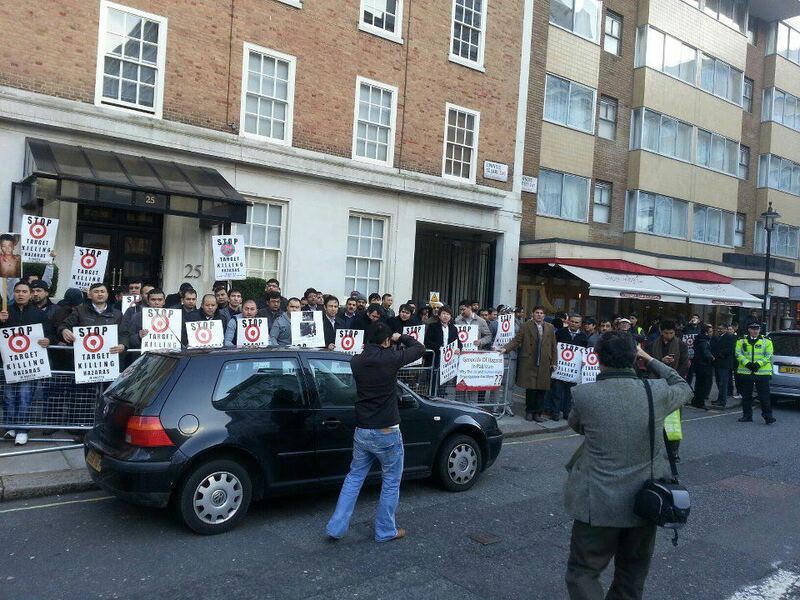 However, some saboteurs hurriedly booked another venue outside Afghan Embassy, London to hold such protest. It was because of their short-sightedness and amateur approach towards sensitive political issues who regard Afghan Embassy London superior to other international organisations in the UK and believe that holding a protest there shall provide ultimate salvation to predicament of under-represented Hazaras in Afghanistan. Therefore, HIFGB, HUMUK and others who had announced earlier to hold the protest in front of 10 Downing Street on 12-11-2015 has been called off to pay homage to the recently beheaded Hazaras of Afghanistan and express resolute support to their aggrieved families. Posted in Afghanistan, Press and Information, Protests and Demonstrations and tagged 10 Downing Street, calling off protest. Bookmark the permalink. 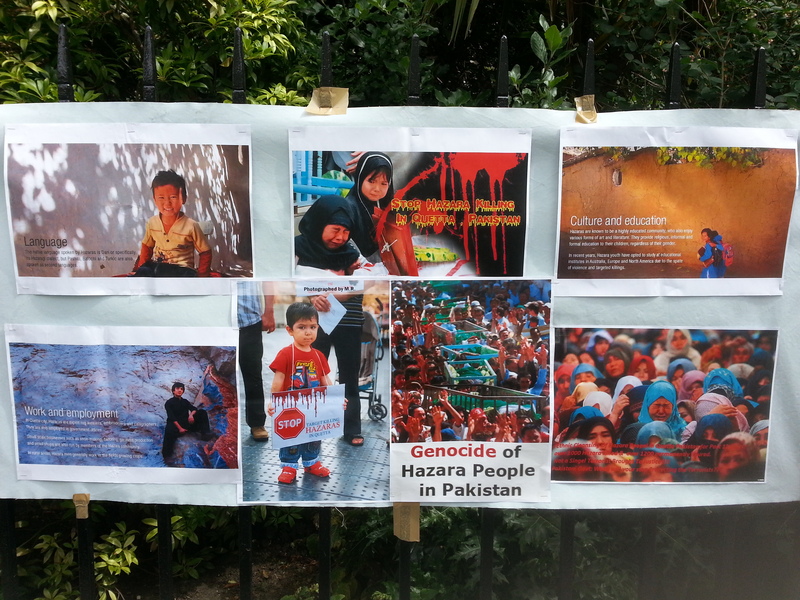 Hazara United Movement (HUM), United Kingdom and Hazara International Forum of Great Britain have organised a protest in front of 10 Downing Street, London on 12-11-2015 to highlight the ongoing persecution of Hazaras in Afghanistan and Pakistan. The peaceful protest is taking place at a time when the kidnappings and brutal beheadings of Hazara men, women and children have become regular occurrences in volatile Afghanistan, especially the recent kidnapping of seven (7) Hazara men, women and children in Zabol Province. The dead bodies of the abductees were found on 07-11-2015 with their throats slits and decapitated. Although, terrorist organisations such as the Taliban and Daesh (the newly-emerging Middle Eastern terrorist group) are blamed for these atrocities, however, the Afghan government cannot turn a blind eye to these regular incidences of persecution. In truth, Ashraf Ghani’s covert support to these terrorist organisations has further deteriorated the situation. 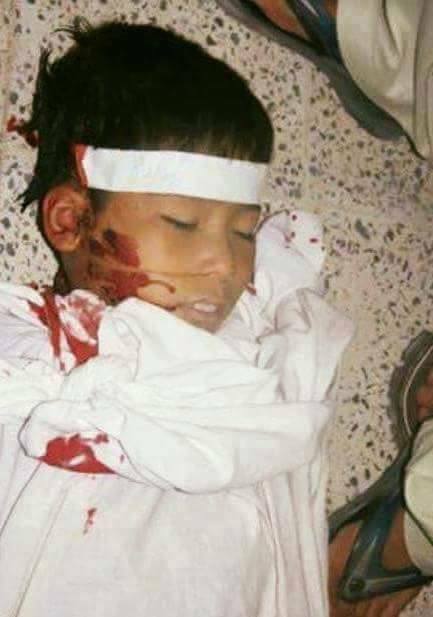 This nine years old boy’s throat was slit in Zabol province, Afghanistan. Similarly, the protest will also raise voice against ongoing targeted-attacks on Hazaras in Quetta, Pakistan which have gained momentum in the past week or so. These attacks occur in broad daylight in busy town centre in Quetta but the Balochistan provincial government and the federal government still fail to arrest the perpetrators. The 16 years’ long perpetual targeted attacks on people of a particular ethnicity and faith amount to GENOCIDE by any definition and must be recognized as such. Whilst, the failure of government in non-arrest of target-killers shows its complicity in such crimes. Venue: 10 Downing Street, London, SW1A 2AA. 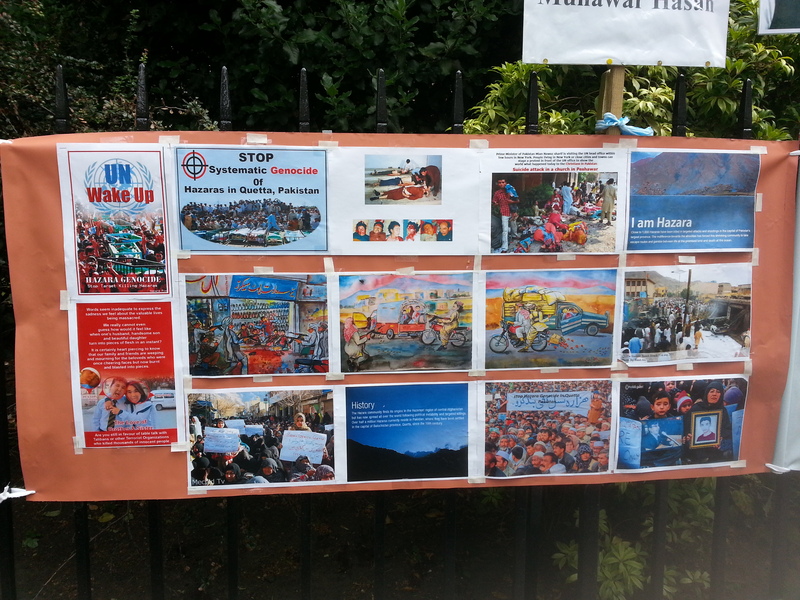 Posted in Afghanistan, Pakistan, Protests and Demonstrations and tagged Protest in London. Bookmark the permalink. The two-day sit-in protest, which started at 10 PM on 10-6-2015, ended peacefully with mutual consultation and consent of Hazara leadership in Quetta. The sit-in protest managed to secure the safe release of Athar Khan Hazara who was abducted by Frontier Corps from Spin Karze Coal Depot without any viable charge. This abduction came in the wake of the recent fiery speeches of Tahir Khan Hazara, a veteran politician, who sharply criticized Pakistan army and the intelligence agencies for being complicit in perpetual targeted attacks. Tahir Khan Hazara started his political career with working with Ghaos Buksh Bezinjo of National Party. This retaliatory abduction of Athar Khan Hazara reflects the typical mindset of the security agencies in exerting maximum pressure on campaigners and politicians in Pakistan with an effort of curbing criticism against army and intelligence agencies of Pakistan. Tahir Khan Hazara is widely respected by Hazaras and non-Hazaras alike due of his vivid standpoint on Pakistan’s discriminatory and self-centered policies against the minorities. His vocal and honest viewpoints about the killings of Hazaras in Pakistan raised eyebrows of civil and military establishment who resorted to abduction of his innocent son without credible charges. These arbitrary actions against honest and sincere people in Pakistan has alienated their interests and sympathies towards state organs. It is highly likely that prospective sit-in protests and demonstrations, organised outside Pakistani Missions on a foreign soil, could get out of control due to cold and unprofessional attitude of the diplomatic officials. Similar trend of the diplomatic staff was witnessed in the two day sit-in protest outside Pakistani High Commission in London. Such official malpractice was manifested by its Head of Chancery and the incumbent High Commission whose behaviour as such has brought disrepute to the Government of Pakistan. Despite attempts from the Chief Organiser of the sit-in protest for meeting the Pakistani High Commissioner to convey their demands, the Head of Chancery and other staff of the High Commission exhibited reluctance in facilitating such a meeting. Similarly, the Pakistani High Commissioner feels pride in portraying himself as a viceroy, with the support of the red tape in the High Commission, which has further tarnished the already dilapidated reputation of Pakistan on a foreign soil. HUM is thankful to all those who showed their support and sympathy to the protesters by phone, emails, text messages as well as joining the sit-in protest with their families and kids. We are, particularly, thankful to Dunya TV Channel for coverage of the event. Visit our facebook page to view the video coverage of the event. 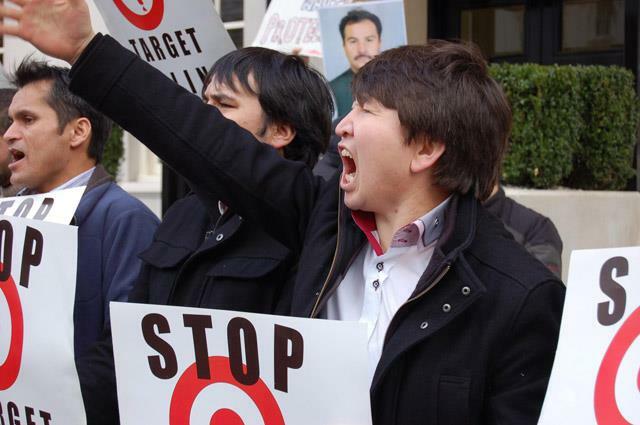 Posted in Pakistan, Protests and Demonstrations and tagged Athar Khan Hazara, Tahir Khan Hazara. Bookmark the permalink. 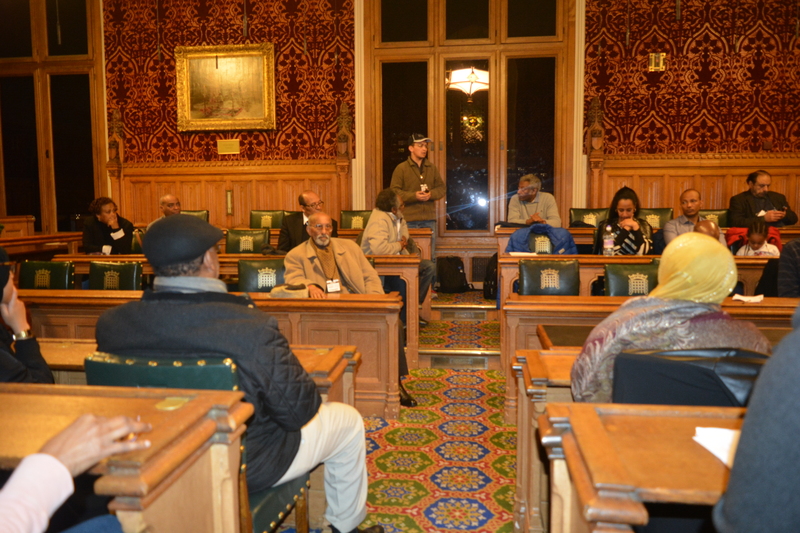 The Ogaden Civic Society, UK organised a conference in the House of Lords to invite views from minority rights groups, human rights activists, members of parliament, Lords and other active members of civil society about the on-going grave human rights abuses in Ethiopia. A large number of people of all walks of life, including the representative of Amnesty International for East Africa, minorities rights’ organisations, intellectuals and MPs attended the conference to pledge their support to the Ethiopian people. A handbill, distributed among the people, highlighted mass human rights violations perpetrated by the Ethiopian army including its security agencies, appealing to the international community for taking serious action against the Ethiopian government. Among other valuable speakers, Liaquat Ali Hazara – representing Hazara United Movement (HUM), United Kingdom was invited for sharing his views over the ongoing persecution of minorities in South Asian countries including Afghanistan with emphasis on strategic and tactical approaches towards combating the spread of religious extremism, militancy, terrorism and intolerance in the region. LAH sketched a clear picture of the volatile situation with particular focus on the extension of ISIS from Middle East to countries like Afghanistan and Pakistan. He expressed grave concern and urged the international community for taking the right step at the right time to harness such menace. He also thanked the Ogaden Civic Society for organising the conference and hoped that such initiatives could bring together minorities on a platform for greater community cohesion and integration. Posted in Other Minorities, United Kingdom (General) and tagged Ethiopia, Ogaden. Bookmark the permalink. A conference on the tremendous services of Late Tony Benn was held in Wilson Room, Portcullis House, House of Commons on 17-03-2015 from 6:00 PM to 8:00 PM which gathered huge crowd from people of all walks of life including the sons of the deceased, MPs, human rights activists and minority rights campaigners. 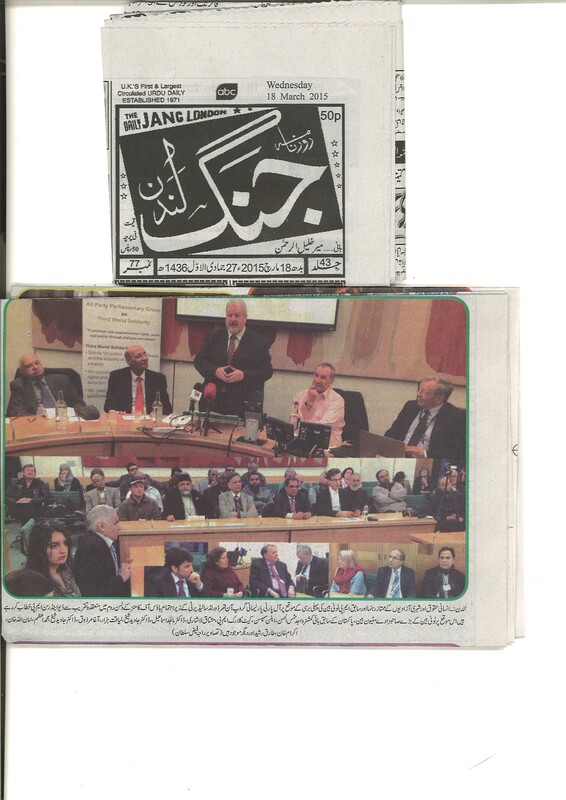 The conference was organised by the APPG on Third World Solidarity while the Hazara United Movement (HUM), United Kingdom attended this conference to laud the humanitarian services of him which furthered such noble cause and of the under-represented ethnicities of Africa and Asia. Below is the News Coverage of the event. Posted in United Kingdom (General) and tagged Tony Benn. Bookmark the permalink.